Remember when I talked about Potato Idols? Well, it looks like Satoyama have changed it into Cabbage Patch Idols, a vegetable which is even more bland and boring! And, surprise surprise, they added Riho into this unit! Well, if Cabbage or Potato doesn't subscribe her blandness perfectly, then really, what else can? You know, I feel like Satoyama should have called this song Potato Hakusho, because Cabbage Hakusho doesn't sound cute at all, and Potato does... a little. I mean, really now, Cabbage? Who the hell likes cabbage? Not me, that's for sure, and most other kids/teenagers hate it too. It's just an all around horrible vegetable in my opinion. The name of this single really does not attract me in the least, though it does fit with the whole nature and food theme that Satoyama has, which is a bonus for them. However, it does make me think that Potatoberry are Cabbage Patch Kids now, because that's what Cabbage also reminds me of... cute, kinda freaky dolls. Sadly, no Cabbage Patch Kids show up in this video, and surprisingly, neither does cabbage! Weird, huh? Well, it would have killed the video if they showed the girls gorging on Cabbage, because that would be A) Funny, and B) Disturbing at the same time. Ew, cabbage... Not what I want to see my Idols eat on a summer/winter day in the Wota world. WOW!!! Look at that SKY!!! Okay, admittedly, Riho looks absolutely adorable here. Riho: "Want some Opium seeds...?" This scenery is really soothing, you know? I actually love the fact that the girls are outdoors instead of in a bloody studio. It's a gorgeous change of pace. Wait, there's a different scene to walking around fields, country roads and woodland? YAY!!! 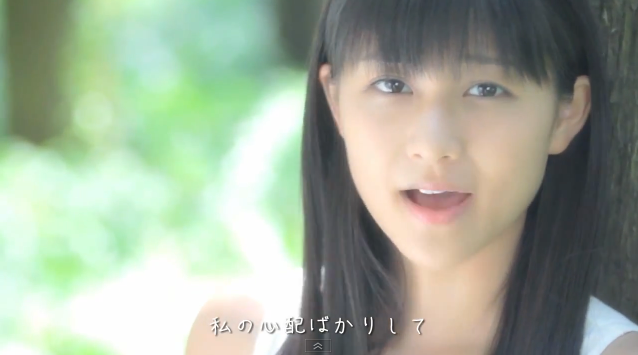 Again, Dawa, you're freakin' beautiful, why did I never like you!? Ah look, that Smug little smile has returned!!! Welcome back, Smugleaf! Winning smiles, though Dawa looks soulless. Dawa, why are you out of the woods!? Get back in there!!! If you don't know or recognise those lyrics... you have not lived because that movie is AWESOME! Gaaah, Dawa! Something is growing in your hands! Arrrgh!!! Are those the rumoured cabbage seeds? I absolute adore the scenery, and I won't get over it. EVER!!! Riho: "Muahahaha... my plan to become Chiima's Number 1 will soon commence..."
Riho, looking a little evil but still very cute in this shot. Yes, Riho, that is the sky. Something that you don't normally see when holed up in a studio like you normally are. Lookin' a little bit high there, aren't we Dawa? Did Riho give you some Opium seeds, too? ... I'm not kidding, I want it. Awww, how cute! Riho looks so happy to see real grass, sunshine and sky! Dawa: "It's been a while, my sky..."
Even Dawa is happy to see the sky once again after being holed up in a studio for so long! Hey, is that a glass of whisky or Cider next to Dawa? I bet it's the Whisky! Those alcoholics! Okay, so firstly, let's just say this... I am so happy to finally see a PV which is set outside instead of inside a studio or a warehouse, a PV which relies on the scenery and the girls, and one which doesn't focus on special effects or anything like that. Satoyama are amazing for teaming up with Hello! Project and getting the word out there about nature, because it means something different, something far more refreshing for our H!P ladies and their audience. 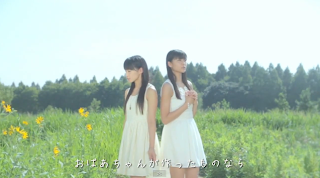 Satoyama has allowed the girls to go outside and to create something different that recent PV's now lack. Yes, I do like Satoyama. In fact, I hope that they stay forever now, because I really like outdoor video's. They're a lot nicer in my opinion. 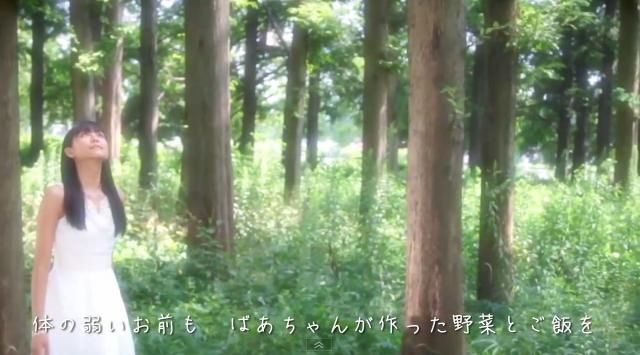 Hence why My Days For You is my favourite Mano Erina PV. 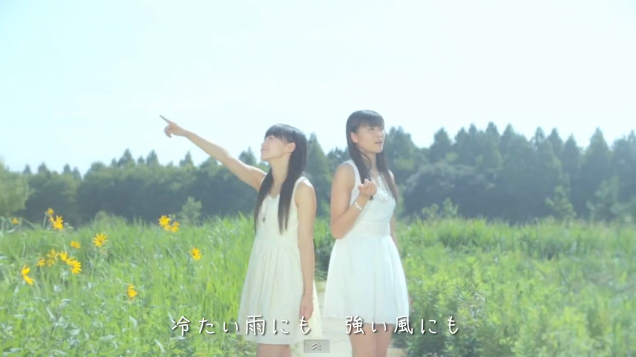 So, that said, yes, I really do like this PV, maybe even love it. It's new, and it's refreshing to see. I think that it's absolutely gorgeous, and allows the fans to appreciate the beauty of the Japanese countryside as well as the simplicity that nature gives us, whilst still being beautiful and entertaining as well. This video may be simple, but I really enjoy it and I think that this is what future PV's should be like for the other Hello! Project groups, because special effects aren't always what they're made out to be, in my opinion. Oh boy, this video is making me feel bad! Not good!!! 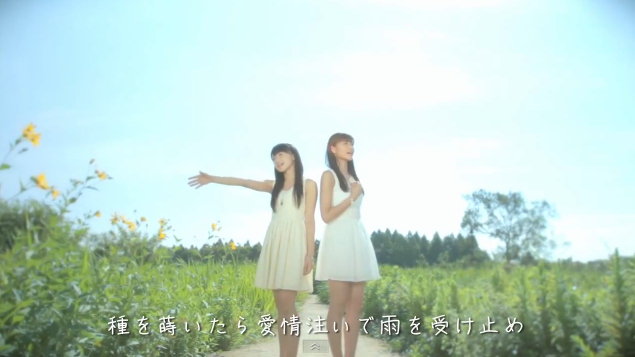 Speaking of innocence and simplicity, both Dawa and Riho are absolutely wonderful in this. I actually thought that I wouldn't like the video or the song because of how little I care for these girls, but seeing them both in a new environment together is like seeing a new side of these girls. They both seem so much more at ease, they look relaxed and whilst their expressions may be calm and downplayed, they do look happy. I really enjoyed how in tune they were with the song, their surroundings and with each other. These two really work, and I have to say, I fell for them both in this video. 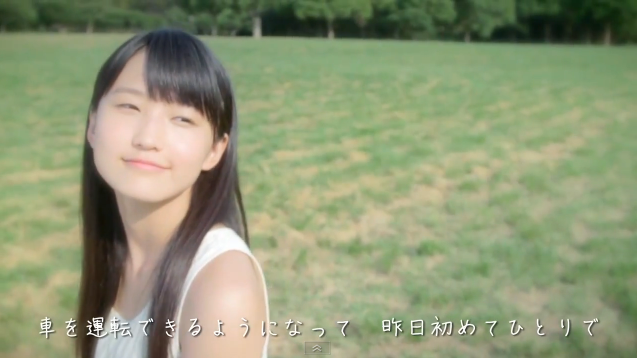 Riho looked so innocent and carefree in this video, it was like seeing a new person. Usually you see a rather smug girl who is passionate about dancing, and who seems to have a more serious side to her, but here she is so much more at ease and she seems to be more open to where she is. It was nice to see her like this, and I really loved her performance. She seemed very free with how she moved in the video, despite that she stood still and didn't dance, and how she reacted to her surroundings was just lovely. It's absolutely refreshing to see her like this, and I really prefer this side to Riho, I really do. I actually would love to see more of this side. Dawa herself, a girl who is quite random and very proud of the group she is the leader of, was extremely calm and relaxed here. She showed such a genuine appreciation for the woodland around her and the scenery. You can tell that she just loved being there, taking in the beauty of everything, as if she wanted to stay there. It was so wonderful to see this side of her, just like it was with Riho. These two are just wonderful together, and they really showed that they have different sides which we rarely see, but sides that we have now experienced in this video. I just love how they are so in tune with each other, and how you can truly see that they love their country and the nature around them. It's beautiful. The song is also extremely beautiful, and honestly, I thought that I would hate this song after hearing the concert preview. 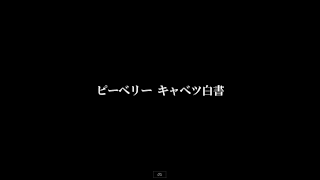 I thought that it was dull, boring and uninspired, just like the name of the song, but after hearing it in high quality thanks to the PV, I have really grown to adore the sound of the song. It's so gentle and soothing, and the music box opening is just gorgeous. It's a wonderful slow song, one which really takes you in and allows you to appreciate the beauty of the instrumental and the voices of both Riho and Dawa. Really, I didn't know that these two could sound so gorgeous, but they do. This is the type of song that they both suit a lot. I know I talk bad about Riho's voice, but that's because I hate how she sounds in high songs, songs that she clearly can not handle. But then there are songs like this, slow and gentle songs which really allow her voice to truly shine and allows you to hear her true potential as a singer. These are the sorts of songs that Riho should sing as a lead in, because she sounds fantastic here. It's basically the same with Dawa, although I have more of a problem with how nasally she can be in most songs. This song though shows off just how gorgeous her voice truly is. She sounds amazing here, and both she and Riho are a great pair when together. They sound very good together, something which I thought would not happen, but they work, and Cabbage Hakusho is a song that works so beautifully for them. 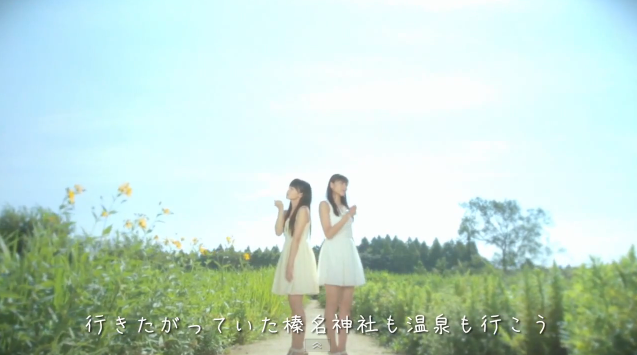 The slow pace of the song and the gentle feel of the PV work so beautifully together, and it has really made me appreciate not only the simplicity of the video, but also how beautiful both Riho and Dawa sound in a song like this. It makes me hope that, in the future, Hello! Project will give these two more songs, in and out of their own individual groups, that are just like this one, songs that show off their voices and just how great they can be when the girls aren't pushed over their limit with what they can and can't sing. It's a gorgeous song, with an equally gorgeous video. Despite the boring title, this video is a winner and really allows you to see the true beauty of nature, and to appreciate what you have around you. Cabbage Hakusho was nice and the lyrics were cute! I don't know what the lyrics mean, but I picked up on Obaa-san and oishi a lot, so I think it's probably about how they love their Obaa-san's cabbage because it's delicious? Either way, I found the song nice and pleasant to listen to!